For other uses, see Pig War (disambiguation). The lines are as shown on maps of the time. The modern boundary follows straight line segments and roughly follows the blue line. The modern eastern boundary of San Juan County roughly follows the red line. Bloodless war – San Juan Islands awarded to the United States following third-party arbitration. The Pig War was a confrontation in 1859 between the United States and United Kingdom over the British–U.S. border in the San Juan Islands, between Vancouver Island and the mainland. The Pig War, so called because it was triggered by the shooting of a pig, is also called the Pig Episode, the Pig and Potato War, the San Juan Boundary Dispute and the Northwestern Boundary Dispute. With no shots exchanged and no human casualties, this dispute was a bloodless conflict. The Oregon Treaty of June 15, 1846, resolved the Oregon boundary dispute by dividing the Oregon Country/Columbia District between the United States and Britain "along the forty-ninth parallel of north latitude to the middle of the channel which separates the continent from Vancouver Island, and thence southerly through the middle of the said channel, and of the Strait of Juan de Fuca, to the Pacific Ocean." However, there are actually two straits that could be called the middle of the channel: Haro Strait, along the west side of the San Juan Islands; and Rosario Strait, along the east side. In 1846, there was still some uncertainty about the geography of the region. The most commonly available maps were those of George Vancouver, published in 1798, and of Charles Wilkes, published in 1845. In both cases the maps are unclear in the vicinity of the southeastern coast of Vancouver Island and the Gulf Islands. As a result, Haro Strait is not fully clear either. In 1856, the US and Britain set up a Boundary Commission to resolve a number of issues regarding the international boundary, including the water boundary from the Strait of Georgia to the Strait of Juan de Fuca. The British appointed James Charles Prevost First Commissioner, George Henry Richards Second Commissioner, and William A. G. Young Secretary. The US appointed Archibald Campbell First Commissioner, John Parke Second Commissioner, and William J. Warren Secretary. On June 27, 1857, the American and British commissioners met for the first time on board the British ship HMS Satellite, anchored in Esquimalt Harbour. The two sides met several more times in 1857 in Esquimalt Harbour and Nanaimo Harbour, and corresponded by letter between meetings. The water boundary was discussed from October to December. From the start, Prevost maintained that Rosario Strait was required by the treaty's wording and was intended by the treaty framers, while Campbell had the same opinion for Haro Strait. Only Rosario fulfilled these requirements, he wrote. Campbell countered that the expression "southerly", in the treaty, was to be understood in a general sense, that Rosario Strait did not separate the continent from Vancouver Island, but the San Juan Islands from Lummi Island, Cypress Island, Fidalgo Island, and others, and that navigability was not germane to the issue, but even if it was, Haro Strait was the wider and more direct passage. Finally he challenged Prevost to produce any evidence showing that the treaty framers had intended Rosario Strait. 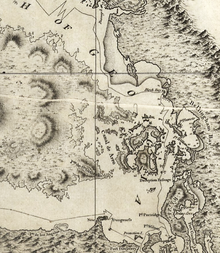 Prevost responded to the challenge by referring to American maps showing the boundary running through Rosario Strait, included one by John C. Frémont, produced for and published by the US government, and another by John B. Preston, Surveyor-General of Oregon in 1852. To the other points, Prevost repeated his statements about Rosario Strait's navigability—the channels between Lummi, Cypress, and Fidalgo islands not being navigable—and that a line through Rosario would be southerly, while one through Haro would have to be drawn westerly. The two continued to discuss the issue into December 1857, until it was clear what each side's argument was and that neither would be convinced of the other. Prevost made a final offer at the sixth meeting, December 3. He suggested a compromise line through San Juan Channel, which would give the US all the main islands except San Juan Island. This offer was rejected and the commission adjourned, agreeing to report back to their respective governments. Thus ambiguity over the water boundary remained. Because of this ambiguity, both the United States and Britain claimed sovereignty over the San Juan Islands. During this period of disputed sovereignty, Britain's Hudson's Bay Company established operations on San Juan and turned the island into a sheep ranch. Meanwhile, by mid-1859, twenty-five to twenty-nine American settlers had arrived. San Juan Island held significance not for its size, but as a military strategic point. 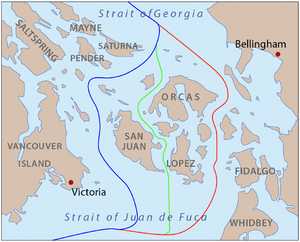 While the British held Fort Victoria on Vancouver Island to the west, overlooking the Strait of Juan de Fuca, the entry point to Haro Strait, leading to the Strait of Georgia, the nation that held the San Juan Islands would be able to dominate all the straits connecting the Strait of Juan de Fuca with the Strait of Georgia. General George B. McClellan, George Pickett’s West Point Classmate and lifelong friend, claimed that General William S. Harney and Pickett conspired with a cabal, to start a war with Britain, creating a common enemy, to head off a north-south confrontation. However, General Granville O. Haller debunked McClellan's theory. He said they had wanted to start a war, but with hope of distracting the north so that the south could gain independence. The theories are given credence when it is noted that Major General Silas Casey, then a Lieutenant Colonel and deputy commander of the 9th Infantry Division, was reduced to a support role for Captain George Pickett who was given independent jurisdiction over a vast area by Harney, then a Brevet Major, and was also passed over by Harney in favor of Pickett when given this choice command. On the other hand it can be said that Lt Col Casey had not been reduced, for he was given command over the USS Massachusetts and Major Haller to protect and supervise the water of Puget Sound. He was given discretion to deviate from his orders, based on his military experience. (His textbook on infantry tactics was used at West Point during the Civil War). On June 15, 1859, exactly thirteen years after the adoption of the Oregon Treaty, the ambiguity led to direct conflict. Lyman Cutlar, an American farmer who had moved onto San Juan Island claiming rights to live there under the Donation Land Claim Act, found a large black pig rooting in his garden. He had found the pig eating his tubers. This was not the first occurrence. Cutlar was so upset that he took aim and shot the pig, killing it. It turned out that the pig was owned by an Irishman, Charles Griffin, who was employed by the Hudson's Bay Company to run the sheep ranch. He also owned several pigs that he allowed to roam freely. The two had lived in peace until this incident. Cutlar offered $10 to Griffin to compensate for the pig, but Griffin was unsatisfied with this offer and demanded $100. Following this reply, Cutlar believed he should not have to pay for the pig because the pig had been trespassing on his land. (A probably apocryphal story claims Cutlar said to Griffin, "It was eating my potatoes." Griffin replied, "It is up to you to keep your potatoes out of my pig.") When British authorities threatened to arrest Cutlar, American settlers called for military protection. Brigadier General William S. Harney, commanding the Department of Oregon, initially dispatched Captain George Pickett and 66 American soldiers of the 9th Infantry Regiment under Pickett’s command, to San Juan Island with orders to prevent the British from landing; the regiment sailed aboard USS Massachusetts. Concerned that a squatter population of Americans would begin to occupy San Juan Island if the Americans were not kept in check, the British sent three warships under the command of Captain Geoffrey Hornby to counter the Americans. Pickett was quoted as saying defiantly, "We'll make a Bunker Hill of it," placing him in the national limelight. Pickett sited his company and battery near the Hudson's Bay Company's Belle Vue sheep farm located near today's Cattle Point Light, and directly under the guns of HMS Satellite. 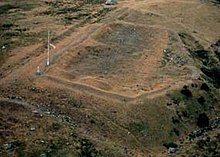 When this tactical error was pointed out, Capt Pickett moved his battery of cannon a few miles north to high ground overlooking both Griffin Bay and the Strait of Juan de Fuca, and commenced to build a redoubt for his cannon. The situation continued to escalate. By August 10, 1859, 461 Americans with 14 cannon under Colonel Silas Casey were opposed by five British warships mounting 70 guns and carrying 2,140 men. The governor of the Colony of Vancouver Island, James Douglas, ordered British Rear Admiral Robert L. Baynes to land marines on San Juan Island and engage the American soldiers under the command of Brigadier-General Harney. (Harney's forces had occupied the island since July 27, 1859.) Baynes refused, deciding that "two great nations in a war over a squabble about a pig" was foolish. Local commanding officers on both sides had been given essentially the same orders: defend yourselves, but absolutely do not fire the first shot. For several days, the British and U.S. soldiers exchanged insults, each side attempting to goad the other into firing the first shot, but discipline held on both sides, and thus no shots were fired. In September, U.S. President James Buchanan sent General Winfield Scott to negotiate with Governor Douglas and resolve the growing crisis. This was in the best interest of the United States, as sectional tensions within the country were increasing, soon to culminate in the Civil War. Scott had calmed two other border crises between the two nations in the late 1830s. He arrived in the San Juans in October and began negotiations with Douglas. As a result of the negotiations, both sides agreed to retain joint military occupation of the island until a final settlement could be reached, reducing their presence to a token force of no more than 100 men. The "English Camp" was established on the north end of San Juan Island along the shoreline, for ease of supply and access; and the "American Camp" was created on the south end on a high, windswept meadow, suitable for artillery barrages against shipping. Today the Union Jack still flies above the "English Camp", being raised and lowered daily by park rangers, making it one of the few places without diplomatic status where U.S. government employees regularly hoist the flag of another country, though this is for commemoration purposes. During the years of joint military occupation, the small British and American units on San Juan Island had an amicable mutual social life, visiting one another's camps to celebrate their respective national holidays and holding various athletic competitions. Park rangers tell visitors the biggest threat to peace on the island during these years was "the large amounts of alcohol available". This state of affairs continued for the next 12 years. The dispute was peacefully resolved after more than a decade of confrontation and military bluster, during which time the local British authorities consistently lobbied London to seize back the Puget Sound region entirely, as the Americans were busy elsewhere with the Civil War. In 1866, the Colony of Vancouver Island was merged with the Colony of British Columbia to form an enlarged Colony of British Columbia. In 1871, the enlarged colony joined the newly formed Dominion of Canada. That year, the United Kingdom and the United States signed the Treaty of Washington, which dealt with various differences between the two nations, including border issues involving the newly formed Dominion. Among the results of the treaty was the decision to resolve the San Juan dispute by international arbitration, with German Emperor Wilhelm I chosen to act as arbitrator. Wilhelm referred the issue to a three-man arbitration commission which met in Geneva for nearly a year. On October 21, 1872, the commission decided in favor of the United States. The arbitrator chose the American-preferred marine boundary via Haro Strait, to the west of the islands, over the British preference for Rosario Strait which lay to their east. Canadian politicians and public, already angry with the Oregon Treaty, were once again upset that Britain had not looked after their interests, and Canada sought greater autonomy in international affairs. The Pig War is commemorated in San Juan Island National Historical Park. Henry Martyn Robert who later published Robert's Rules of Order was stationed on the island for much of the period. Captain George Pickett, later of Pickett's Charge fame, was in charge of the initial American landing force. Captain Geoffrey Hornby, commander of the initial British naval force deployed, would later be promoted to Admiral of the Fleet, the highest rank in the Royal Navy, and earned a reputation as a pre-eminent tactician and fleet commander. Look up Pig War in Wiktionary, the free dictionary. Aroostook War, the "Northeastern Boundary Dispute"
War of the Stray Dog, a brief war that began under similar circumstances. ^ Oregon Treaty from Wikisource. Visited October 16, 2006. ^ a b c d e f g h i j Matthews, Todd. "The Pig War of San Juan Island". The Tablet. www.wahmee.com. Archived from the original on 2008-07-09. Retrieved 2012-09-07. ^ Hayes, Derek (1999). Historical Atlas of the Pacific Northwest: Maps of exploration and Discovery. Sasquatch Books. pp. 171–174. ISBN 1-57061-215-3. ^ a b Phil Dougherty (28 February 2010). "The International Boundary Commission first meets on June 27, 1857". HistoryLink.org. Online Encyclopedia of Washington State History. p. 9328. Retrieved 19 July 2013. ^ Scholefield, Ethelbert Olaf Stuart; Howay, Frederic William (1914). British Columbia from the earliest times to the present. Vol. 2. The S.J. Clarke publishing company. pp. 303–306. OCLC 697901687. Retrieved 22 June 2011. ^ a b c d e f g h i j k "The Pig War". National Park Service, U.S. Department of the Interior. Archived from the original on 2007-01-10. Retrieved 2012-09-07. ^ Vouri, Michael (2016). The Pig War. 164 S, Jackson, Seattle WA98104: Discover Your Northwest distributed by University of Washington. pp. 174–176. ISBN 978-0-914019-62-6. ^ a b c Vouri, Michael (2016). The Pig War. 164 S, Jackson, Seattle WA98104: Discover Your Northwest distributed by University of Washington. pp. 69–72. ISBN 978-0-914019-62-6. ^ a b c d e f g h i j k Woodbury, Chuck (2000). "How One Pig Could Have Changed American History". Out West #15. Out West Newspaper. Retrieved 2006-10-16. ^ Tagg, Larry (1998). "The Generals of Gettysburg". Savas Publishing. Archived from the original on October 22, 2014. Retrieved June 14, 2010. ^ "Belle Vue sheep farm". ^ Vouri, Mike (2008). The Pig War. Charleston, S.C., Chicago,IL: Arcadia Publishing. ISBN 978-0-7385-5840-0. ^ a b c "The Pig War". San Juan Island National Historical Park. National Park Service. Retrieved 2009-06-19. ^ a b Vouri, Michael (1999). The Pig War: Standoff at Griffin Bay. Griffin Bay. p. 273. ISBN 978-0-9634562-5-0. Baker, Betty (1969). The Pig War. HarperCollins Canada. ISBN 0060203331. Coleman, E.C. (2009). The Pig War: The Most Perfect War in History. The History Press. ISBN 978-0-7524-5227-2. Holtzen, Mark (2012). The Pig War. CreateSpace. ISBN 1475051360. Kaufman, Scott (2003). The Pig War. Lexington Books. ISBN 0739107291. Neering, Rosemary (2011). The Pig War: The Last Canada–US Border Conflict. Heritage House Publishing Co. Ltd. ISBN 1926936019. Vouri, Michael (1999). The Pig War: Standoff at Griffin Bay. Griffin Bay Book Store. ISBN 0963456253. Wikimedia Commons has media related to Pig War.